The Paimio Chair: Modern Humanism | What is it worth? 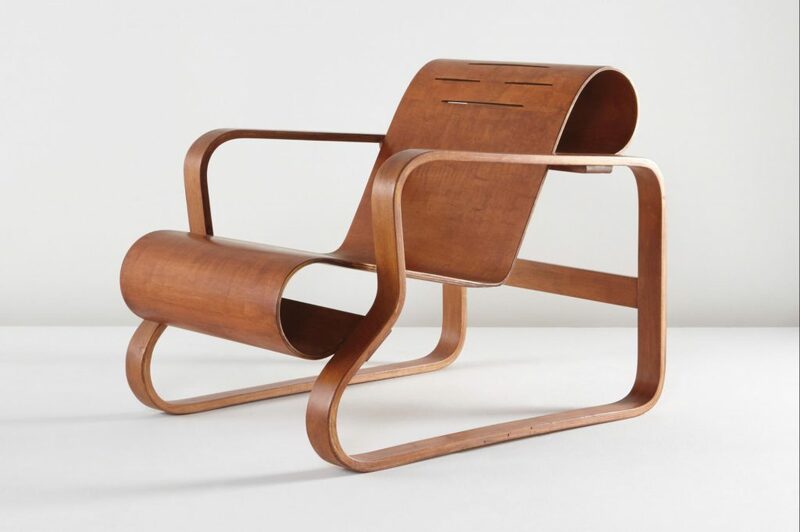 Paimio Chair, Alvar Aalto, c. 1935, Birch-veneered molded plywood, bent birch. Manufactured by Oy Huonekalu-ja Rakennustyötehdas Ab, Turku, Finland. Sold for $22,500 at Phillips. Photo courtesy of Phillips Auctioneers. The Paimio Chair epitomizes the humanism, functionalism and innovativeness of modern design. Designed by Finnish architect Alvar Aalto for the tuberculosis sanatorium in Paimio, this chair softens the strict lines of modern functionalism with the humanistic touch of natural materials. The sculptural bent plywood body is the result of numerous experiments with wood bending technique, eventually perfecting the form for the use of tuberculosis patients. The back angle of the chair allows the sitter to breath better and the cuts on the upper back are for ventilation to comfort the often-sweating patient. The chair is sturdy yet light enough for tuberculosis patients to carry, allowing them to move freely in the premises and take in fresh pine forest air, which was the only cure for the disease at the time. In order to minimize the cost, thus the burden for the city council and taxpayers, Aalto used birch wood, which is plentiful throughout Finland, making the chair low cost. The Paimio Chair is the perfect example of thoughtful design, where the designer considers every little detail and aspect. The iconic curvy form and organic material of the Paimio Chair laid the foundation for the worldwide infatuation with the Scandinavian Modern furniture design, which lasted until mid-1960s.